from the urban rat race. 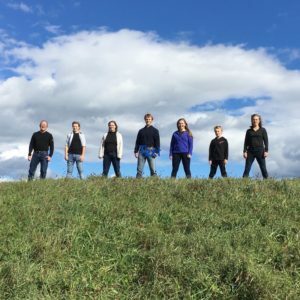 Their five children, played by Jordan Geoffrey LaMothe, Jessica Kimerer Gee, Kyra Lewis Gee, Kai Evenson LaMothe, Leif LaMothe Gee – want horses, cows, chickens, ducks – except for one of them – who rebels and wants out of the whole deal. As you may have guessed from the names, the on-stage show was inspired by the real-life family of its cast/creators. In 2005, Kimerer L. LaMothe and her husband Geofferey K Gee moved to the country with their three older children (the younger children were born on the farm). They have been performing together since 2012, originally in cabaret-style variety shows. In 2016, the musical “Hamilton” happened, and LaMothe/Gee started writing a book musical loosely based on their lives, which premiered in Salem, NY in July 2017. In 2018, “Happy If Happy When” was accepted by Planet Connections Music Festival. LaMothe also joined Theater Resources Unlimited (TRU) and participated in the TRU Writer-Producer Speed Date, where she met Gene Fisch, Jr., Executive Director of New York New Works Theatre Festival (NYNW), who invited them to submit – and they were accepted. At their second performance at NYNW, producer Ronald J. Meyers, who was in the audience, contacted them with the intention of producing a preview, limited engagement test run at the Gene Frankel Theatre, December 2018. They are now aiming for a 3-5 week Off-Broadway run in Spring 2019. Dr. Susan Horowitz, a.k.a. “Dr. Sue” – (SH): What attracted you to produce “Happy If Happy When”? RM: When I saw the producer’s showcase in the summer of 2017, I was attracted by the notion of the family show and by the preparedness of the five young performers, stage savvy and flawless execution. I noted the quality of the songs that were in that showcase, but actually heard only a small selection. I thought the theme of the play had merit and universal appeal. SH: How did you connect with “Happy If Happy When”? RM: When I met the cast at the preparation for the opening, I was further struck by the sense of family The way they prepare for a show is the way they work together in life. Transporting the scenery, setting it up, each up to the requirements of the performance, moving the props and set on stage, taking everything apart afterwards. Then heading back to the farm, the roosters, the hens, the horse, the cow, the duck, the foundry. They are and they live the American dream. SH: Why did you decide to produce this show? RM: I optioned several projects, but the cooperative relationship that I established with Kimerer LaMothe directly and with her family indirectly made this my delightful first effort as a producer. I have been a student of drama for three score years, have written plays and movies. So I thought I could bring that knowledge to my projects. Actually Kimerer needed little and no guidance from me. She nailed it, and I told her that..
SH: How do you see the future of this show – venues like Off or Off-Off Broadway, Regional, etc.? RM: I want to get some more experienced people aboard to help plan our next move. Whether to Regional theater for short runs, off-Broadway, or even a direct move to Broadway since the play is of such high merit. Any producers listening? SH: Why did you decide to do a test preview run at Gene Frankel Theatre? RM: It was a personal choice, since I know Gail Thacker to be a classy theatre owner.She truly is and presides over a jewel of a venue! SH: What did you get out of the Gene Frankel run? RM: We had ideal support from Gail and Thomas Gordon, and we are greatly indebted to them. We had incredible technical support and stage management. SH: How do you envision the future journey of this show? RM: We’ll cross our fingers and see what comes up. We are very comfortable together, and happily the amity mirrors the amity of that family that explodes on the stage in the musical. I have enjoyed every performance, and note that each performance was better as the cast settled in and rose to majesty of their roles. SH: Do you have any general thoughts about commercial potential of family audience musical?